We invite you to join our free webinar on May 24th, 2017 from 11.00 am to 12.00 pm. 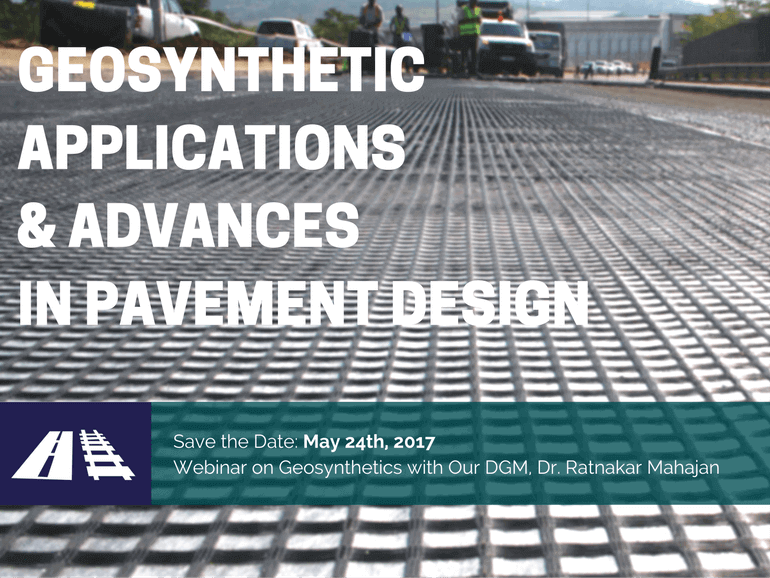 Our Deputy General Manager, Dr. Ratnakar Mahajan will talk about “Geosynthetic Applications & Advances in Pavement Design”. key Maccaferri success stories on the use of geosynthetics in pavements. To register for this free webinar, please click here. Dr. Ratnakar R. Mahajan is Deputy General Manager of Maccaferri India. He has worked as an engineer providing design & drawing services to Maccaferri South African and Indian subsidiaries, which involves conceptualization of the solution and detailed designs related to the geotechnical and hydraulic works sectors. He has significant and diverse experience in various civil engineering fields (soil reinforcement, geotechnical centrifuge modelling, instrumentation, pseudo-static earthquake analysis, ground improvement, retaining structures, slope stability, river training, channel lining, and rockfall protection). He has been associated with prestigious projects in India and abroad. Currently he is involved in R&D works for Maccaferri at a global level. He also has academic experience: he has carried out research on “Centrifuge Model Studies on Geosynthetic Reinforced Soil Slopes” and published papers in a Refereed International Journal and Peer-reviewed International Conferences. He completed his doctoral studies at the IIT Bombay and he has contributed to various guidelines such as IRC 34, IRC 56, IRC 113 etc. We would be delighted if you would like to join us at the Webinar and share engineering experiences with you.